Allow your bathroom to receive the attention and love it deserves by installing the Toulon Cloakroom Suite with Semi Pedestal. This is the perfect package if you’re looking to update and upgrade your ensuites or cloakroom suite with its stylish, angular character you will be adding a designer look to your bathroom (without the designer price tag of course! ), creating a contemporary sanctuary. The Toulon close coupled toilet is a fantastic addition to any modern setting and is just what you need to update your bathroom. With flawless detailing and a luxurious soft close toilet seat, it will look fantastic in any contemporary setting, especially with its attractive white gloss finish. Underneath the marvellous surface is vitreous china, a robust and long-lasting bathroom material that not only looks fantastic but it's super easy to clean. Take it slow with the supplied soft close toilet seat. 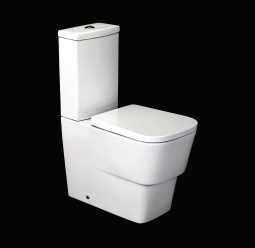 This luxury seat is a comfortable and luxurious option for your toilet. Its gorgeous wrap-around, minimalistic design will certainly give your bathroom serious style points. The slow and steady closing process will ensure the pan doesn’t get damaged if the lid is accidentally dropped. It also minimises any loud bangs. And that’s not all! You will benefit from a dual flush, water efficient cistern. This is a wonderful and practical addition to your bathroom if you have a busy family household where the toilet is constantly being used. A dual flush button limits the amount of water used when flushing by including a split button, a smaller and a larger button. The cleek chrome push button is fitted to the top of the cistern lid. To achieve the perfect pair we have added the Toulon Basin and Semi Pedestal to this package. Sticking to designer style this basin and pedestal compliments the toilet perfectly to bring you’re a cloakroom suite fit for a modern-day king or queen. The semi pedestal makes it ideal for those with limited space as it won’t take up any valuable floor space. The soft, curving lines of the basin will add to the stylish appearance of your cloakroom – leaving your guests green with envy! The basin itself features a wonderfully spacious bowl, which provides plenty of space for washing or cleaning. Positioned above the bowl, you will find a pre-drilled single tap hole which allows you to fit your own basin mixer tap.